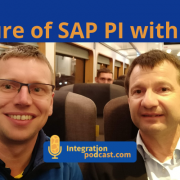 I got a chance to get a conversation with Udo Paltzer, product manager on many integration tools from SAP, about the future roadmap of SAP PI Integration at the SAPSA/IFG conference. There has been a lot of discussion going on what it was and where customers should doing with their SAP PI/PO systems. It was really nice to get a chat with the Expert on the topic of what is the SAP direction. A big topic is the use of SAP PI/PO where it will take us. So we do talk about it together with the SAP roadmap for it. What will the next release of SAP PI be and how you can influence it. What is happening to the BPM/BRM and ABAP stack. I had thought that the dual-stack option was complete of the table for the next release, but it may be possible that even it will be in the release. Though it is not a recommended option, and have not been for a long time. Udo recommended that every user of SAP PI-systems upgrade to 7.5 (newest version), and he also mentioned that users are very welcome to write about any kinds of problems regarding to SAP Pi in the cloud. By doing so it is possible for SAP to react or respond quickly if necessary. The new thing and useful is the option to run CPI on-prem to use for BPM processes, where you have some technical requirement. It is a pretty good way for SAP to be able to leverage dual delivery strategy, to have a rock solid PI for all the “standard” messages. Then they can deliver new innovation on the CPI part. We also cover the new Cloud Integration Suite, which is the iPaaS offering from SAP around all cloud development and tools. It is pretty good to get your hands on to understand what to do and the model allow you to pay for the services that you use. You can read more about the Impuls18 and IFG Integration conference here. We did have some sound problems, so it is not an ideal sound. But the content is pretty good, I hope. If you liked it please share it with your friends.